My kid is sick. Check that. My kid is the whiny, snotty, fussy, irrational, needy, but can never be fulfilled sick. I’m not complaining. Just giving some perspective. Today was going to be my morning “off”. I had plans to write, to pray, and to read. More than anything, I wanted to work on the blog. But my child was sick and that meant he got to stay home with dad. Enter my selfish, it’s all about me attitude. I laid him down to sleep, but it was as if the crib was his personal kryptonite. He constantly stood up and just screamed. My patience quickly exhausted, I started letting it get to me. I went from laying him down by singing to him, talking calmly to him to just laying him down and leaving and then finally to lecturing him about how he should know better (not that he could understand a word I said). Nevermind the fact that he is sick, he should know I’m working on my blog about Becoming Last! He’s ruining my morning! My baby was sick. He felt miserable. And all I could think about was how my expectations were not being met. I realized I had a choice. I could love him unconditionally or I could assert my own interests above his. I quickly went into get him. He smiled at me over the edge of his crib (at least he’s a forgiving baby). I turned off his fan and brought him out to play. For about an hour, we played, I held him, we played some more, and he was a genuinely happy baby. Soon, I fed him, changed him, and laid him back down. I could hear him start to move around and his cough was coming back. All I could think to do was pray so I grabbed my other son (he’s 3) and we said a quick prayer for his baby brother. His prayer was, “God, please help him feel better. Your turn dad.” I smiled and prayed (longer, but no more effective). No kidding. Within a minute, the little guy was asleep. God answered the prayers of a 3 year old and a selfish dad who runs a blog called Becoming Last (oh, the irony). Thankful he was asleep, I whipped out my computer ready to pound out some writing. “Yes, buddy. I’d love to play Go Fish with you.” I’d learned my lesson. So I left that night a little disturbed. Not because I felt like we had been robbed (we would have lost anyway), but because I get so worked up over balls and strikes in a softball league and yet am barely moved at some of the injustices in our world. Maybe we’re not called to right every wrong by ourselves, but as a professing Christian shouldn’t my heart break for the least of these? Isn’t that all throughout the Scriptures? 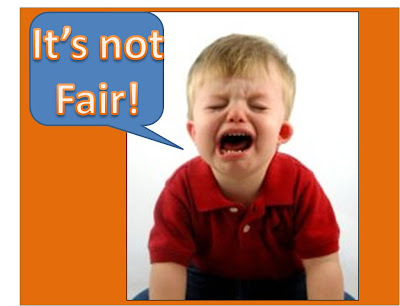 We all have those “it’s not fair” moments and I think that’s fine. It shows we have a sense of right and wrong. But I think to a certain degree our hearts have become calloused over the years toward bigger concerns. And…now I hear my wife emptying the dishwasher which she asked me to do an hour ago…doh! I’m a work in progress! How can you Become Last? One thing (I call everything “things”. I need a better word. I’ll work on that!) I have been praying for is to hear God’s voice throughout the day. Not like a Monty Python thing (there’s that word again) where he breaks through the clouds with a big head and talks to me. More like speaking through my conscience. I think He is always trying to communicate, but I have so much going on I don’t listen. So today, I was off from work and I woke up with a couple of hours to kill. As I’m walking out of the bedroom, I stumble over some clothes. I walk through the den and I trip over some toys. I go into the kitchen and there’s a plethora of things on the counter. Sometimes that wouldn’t bother me. I’m the king of just trudging by stuff. Oh, and my wife hasn’t been feeling great so that’s why it’s messy (she’s the clean one of the house). Then, I felt a prick on the ol’ conscience. So I ate my pop-tarts, took a shower, and started to clean. Even better, my wife got off early and we cleaned as a family. It was actually a fun time as we rocked out (as much as I can with no rhythm) to a cd and spruced up the place. Another way I’m learning to Become Last by listening to God’s voice is through taking more responsibility with Ethan. Yes, I work long days sometimes, but that doesn’t give me a free ride to not doing anything at home. So this morning my wife asks me to change his diaper. For some reason, my first response is always hesitant. I don’t jump at the chance. It’s like I think she has an alterior motive or something. But I quickly swallowed that and stepped up to help. I know. You must think I’m a horrible husband! I’m just trying to be honest as I approach Becoming Last in every aspect of my life. It’s just easier sometimes to let others do things and you begin to take them for granted. I love my wife and she does a lot. I do a lot too, but I should be fighting her tooth and nail to Become Last in our household. This morning, 15 of us went to do Deconstruction on a house for Habitat for Humanity. They do deconstruction and reuse some of the materials on other homes or resell the material for money to use on other homes. It’s hard work, but it’s such a fun time. We took down some walls, tore up flooring, de-nailed wood, bundled wood, cleaned up the site, and other stuff. A very productive day! To be honest with you, I am in no way a handyman. So it’s fun to get out there and try to do stuff, but it also glaringly shows me my limits. However, it does highlight how we are all needed. If just one of the workers had not shown up, that’s less accomplished. Also, since I’m not used to hard labor (insert joke of your choice here), there were times to rest. During my constant frequent occasional break I would watch some of the others work together. You could tell they were enjoying working together and to know you’re doing it to help a deserving homeowner get a house that makes it even more fun. So thanks to everyone who worked out there with me. You really worked hard in that heat! Becoming Last – Day 8 – What Stops Us? Really. Ask yourself that question? I’m beginning to ask myself this question all the time now: What stops me from making an impact, taking a risk, serving with everything I have? And the answer is really simple 99% of the time: me. Maybe I’m becoming an idealist, a dreamer, but have we forgotten what it’s like to dream? Have we forgotten what it’s like to think large? It’s almost like we’ve developed this system of life that stimulates maintenance. We don’t take too many risks anymore. We’re not willing to put our lives on the line. Think about it this way: My wife and I just found out we’re pregnant. Before we got pregnant with our first child we told everyone the standard line, “it’s not our time”. Honestly, a perfectly good reason, but when you dig deeper it just means, “I don’t want to have a kid now.” At least, that’s what it meant for me. The reasons could include one or all of the following: don’t have enough money, we’re in school, we don’t have enough time as it, or wewant to be older. The point is not we should all be having babies. The point is many people could decide to try if they wanted to, but they aren’t ready. They don’t want to have one now and that’s fine. But, here’s where it relates back to Becoming Last. We, definitely me, do the same thing with serving God. We’re either so caught up in our lives that we don’t notice the needs of people around us or we create these excuses as to why we can’t. I’m too young so I’ll wait until college. I’m in school. I’ve got a busy job. We have a new baby. Our kids are playing sports so we don’t have a lot of time. We’re in retirement, now it’s our time to have fun. Do you see my point? Any stage of our life gives us an opportunity to look the other way when God calls for someone to serve. When it comes right down to it, when the intentions of my heart are laid bare, the only thing that keeps me from serving is: Me. How will you use the weekend to Become Last? For the first time in a long time, I jumped out of bed and was pumped to start the day. Not that I hate starting the day, I’m just not normally pumped (psyched, excited, thrilled…one of those). I was actually looking forward to spending time in prayer. So that was good. And it was just like 8 minutes. So after that, of course, I check the Internet. I came to the blog and was pumped that you guys and gals have pushed the days of vitamin A treatment to over 300. Good stuff. I did get an email about changing the sponsor to a non-sports theme. Which is funny. When choosing a sponsor, I basically just chose the one I liked. I didn’t even really think about you folks out there. Sorry, Becoming Last is just not a natural thing to do sometimes. I think what I’ll do is just change the sponsor every once in a while to give them all equal time. Thanks to everyone who has clicked though! One Random Act of Kindness – I posted earlier this week about forgetting to buy water to hand out. Well, thankfully, I’m a caffeine addict. Yes, I know it’s not healthy. I’m a work in progress. But it works out because this morning during prayer I thought about my custodian friend who I see when I get to work. I decided I would bring him a Pepsi. I could tell he appreciated it and it gave us a few minutes to talk. To me, that’s great. I guarantee you that has never crossed my mind before, so it’s encouraging to see God chiseling away at my hard, selfish heart. Encouragement – Thank you to those who have commented, emailed, or tweeted. I love dialogue. I think it keeps us sharp and I appreciate the encouragement. I know I said two, but I added a third! I’m pumped it’s only 6:25am here. I’m looking forward to what the day could bring. If you have a chance, take this challenge. Ask God to make you last today. See what happens. I’d love to hear about it. How can you Become Last this morning?